SPECIAL OFFER: Buy 1 book get all 3! Talk Your Way Out of Credit Card Debt: Phone calls to banks that saved more than $43,000 in interest charges and fees! If you don't believe that Talk Your Way Out of Credit Card Debt can save you 10 times the cost of the book, then you can return it for a full refund and keep the other books as a gift! That's how confident I am that you will save money! Best-selling book at Amazon.com since its release! Best-selling book with over 105,000 copies sold! More than 5,000 copies sold! Learning how to talk your way out of credit card debt is the quickest, easiest, and most efficient way to start saving money! It's true! You can call your credit card banks to negotiate a better interest rate and have fees waived! However, it may not be as easy as picking up the phone and asking. That's because bank representatives are trained to deter you from pursuing the deals you deserve. Overcoming their tactics can be difficult when you don't know what to expect. In this book you will discover proven negotiation strategies, and build your confidence, while learning how to: (1) get annual fees waived; (2) lower your current interest rates; (3) shop for the best credit card deals; (4) get late-payment, overlimit, and cash-advance fees waived; (5) compare loan options and calculate savings; (6) dispute charges and get all your refunds; (7) negotiate account settlements; and much more! "Scott, I wanted to thank you. I ordered your books a few weeks ago and read them right away. I had an incredible amount of confidence when I called to get my credit card rate lowered. It was so easy! They lowered my rate from 10.45% to 3.9% (for a large balance too) for the life of the balance, with no fees. I calculated my savings at $3,968. WOW! Thanks again for your terrific advice!" "When it comes to saving money, there are some deals that are no-brainers. 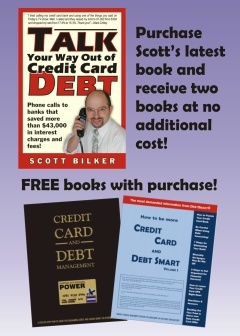 Take Scott Bilker's book Talk Your Way Out of Credit Card Debt: Phone Calls To Banks That Saved More Than $43,000 In Interest Charges and Fees! for example. Not only does he show you how to talk to bank card representatives to lower interest rates, get fees waived and deal with credit card disputes & billing errors, he guarantees you will save over $200 in the process of using his advice or he'll give you a full refund of your money (and keep two other credit card management books for free to boot). It's not often that we are guaranteed a risk-free 1000% return on our money. There's solid advice in dealing with the run-around that representatives are bound to give and making sure you reach to a supervisor who will have more power to help you. While it would be great to have Bilker there negotiating with your credit card company for you, the book is the next best thing to having him make the calls himself." "A valuable book from day one! I was shopping for a book that would help me with the credit card debt I have accumulated. I chose this book. It has proven to be very beneficial to me. It contains a large amount of information your banks don't want you to know. My first night of reading the book, I got up to about page 70 and made my first phone call, with the intent of gaining information about the account and possibly getting a fee reversed. I ended up getting a $50 credit to the account, relatively easily. I cannot praise this book enough! If you need to reduce your credit card debt, this book may very well be your solution." "I just got your books and was inspired to call my major credit card to ask for a reduction in APR. The current rate is variable 12.74%; with a $10000 balance that's costing more than $100 per month in interest. They reduced that rate to 9.9% with no discussion. But here's where I really benefited from having read your book: In talking about that rate, the account supervisor told me they will wire cash advances to my bank account for only 2.99% APR. They will provide as much as $10K per month. So, I could reduce the 19.74% rate to 2.99% rate by having the money wired to my bank and then writing a check to pay off the entire balance! Amazing-- they told me how to save money. So, I just wanted to say that I feel I've already gotten my $19.95 worth from your books. Thanks!" "I have recently found your book Talk Your Way Our of Credit Card Debt and it has really helped me. I have had excellent credit until very recently. I had an automatic payment through the credit card. A few months ago, the minimum payment was $3 over what I had set as the auto pay. I had not noticed that there was a difference until too late. This one time problem cause my interest rates to go up from 3.9% fixed balance transfer rate and a 13% purchase rate to 24.9% and 5.9% fixed balance transfer rate and a 10.9% purchase rate to 27.9%! It affected more than just the one card. I read your book and called customer service on all of my credit card today. I had amazing success. Most of my interest rates went back to their original rates and a few I was able to get lower! One account would not budge, so I transferred to a lower rate. Thank you!!!! You have save me a bundle of money!" "THE CONFIDENCE YOU NEED IS CONTAINED HEREIN...I had the same problem most of you reading this have. But after reading this book from cover to cover, I was awashed with a new vigor and confidence to launch a strategic war of words with the credit card telephone handlers. As you read thru the transcripts of the author's actual calls, picture yourself talking on the phone with the same savvy as he. Then close the book, put up your over charged, over penalized, and over interest rated bill and MAKE CALLS! Show them that you are taking CONTROL of your finances and relish the experience of sticking up for yourself." "I ordered your books and studied them and I have read your newsletter for quite some time. I had close to $55,000 in credit card debt with high interest rates. Following your advice I did balance transfers until I was able to get the interest rate to 3.9 percent and I have paid off four cards and cancelled them. In two years the total has dropped to about $25,000 and is dropping fast with the low interest rate. My son lost his job 7 months ago and your advice saved their home. Keep up the good work and especially keep telling everyone not to trust the banks who issue the credit cards." "I had to write and thank you so much for the book. I just got it yesterday afternoon and started reading it. This morning I decided to try it out on one of my cards that has a very high interest rate. This card had been only about 9.99%, but the interest rate skyrocketed last May and I didn't know why and I really didn't know what to do about it. I called the company this morning and in less then 5 minutes I found out why (I'd had trouble with another card issued by the same company) and got the interest rate lowered from 23.99% to 8.99%. One point lower than it had been before! This one call paid for the book and way more. I figured out how much I saved. It's a good thing I was sitting, because I'm sure I would have fallen on the floor when I realized I saved $10,706.50." "The best book there is on the topic! I unexpectedly run into high debt. So far, I just got this book 2 days ago. I made three phone calls, saved $85 dollars fee for a credit card and about $3,000 in interest charges on one credit card. And this is just the beginning. Extremely helpful book. I honestly recommend it to people like myself because there is always a solution and this book gives me hope." "This is a fantastic book! Bilker walks you through the entire phase of dealing with creditors, on several different issues! If you have ever called a credit card company to discuss lowering your interest rates, or requesting a waiver on that annual fee, you know how humiliating they can make you feel! Bilker teaches you how to gain control and show them who's boss!" "Scott Bilker is one of the most effective negotiators that I know. If you're going to be talking to credit card companies it's well worth getting his book Talk Your Way Out of Credit Card Debt." "....before I start singing the praises of Mr. Bilker's prose style, or his innovative use of trochees and spondees in the anapestic diptych (or whatever), I must admit that when I picked up this nattily turned-out trade paperback, I wasn't exactly expecting William Morris's The Life and Death of Jason....What I did get was a surprisingly witty and to all appearances effective how-to manual for hoodwinking these bloated social parasites that we now know of by the euphemism "banks" into cutting us a little slice of economic justice now and then. Granted, the power is entirely on the side of the large financial institutions, such that Mr. Bilker's winning tactics often shed their savor of victory in a larger context....with the help of Mr. Bilker's book, one can fight a series of strategic rearguard actions, and manage to cut one's losses a bit. After all, there's no sense in completely rolling over and playing dead -- before it's time, anyway." "Talk Your Way Out of Credit Card Debt provides solid advice on getting your rate reduced, annual fees waived, removing a late payment fee, handling disputes, and many other common problems when dealing with credit card companies. More than just advice, it is a collection of detailed examples of phone calls including complete transcripts. Each transcript demonstrates how the author handled a particular issue and the results of the call. Not content to just give one example of getting an interest rate lowered or removing over limit fees, each type of problem has several transcripts so you can get a good feel for what to expect and how to handle it. Most people are not aware of how much power they have when dealing with a credit card company and how to get things changed. This book walks the reader through the process from beginning to end and is a recommended read for anyone looking to gain control of his or her credit card situation." "Scott Bilker lays out a variety of scenarios involving debtors and collectors. He presents several options for coping with each situation, then he takes it a step further by providing a suggested script for dealing with the debt. He also covers things like lowering or eliminating annual fees, getting lower interest rates, dealing with late fees, obtaining cash advances—you name it. This guy's clearly experienced in dealing with financial institutions at the consumer level, and he understands how to play the game. You don't have to use his exact words, but Bilker's dialogue is a good place to start. I haven't road-tested any of his scripts, but the needle on my bovine excrement detector didn't move, so give it a shot." "Talk Your Way Out Of Credit Card Debt by money management expert Scott Bilker is a straightforward, "user friendly" guide to negotiating with credit card banks for better interest rates and getting fees waived. Offering tested strategies for the waiver of annual fees, late payment fees, cash-advance fees and more, shopping for the best credit card deals, comparing loan options, getting refunds, and more, Talk Your Way Out Of Credit Card Debt is very highly recommended reading. Bilker's finance evaluation strategies are extremely useful, even to those who choose to carefully avoid getting into credit card debt in the first place!" "Talk Your Way Out Of Credit Card Debt: Phone Calls To Banks That Saved More Than $43,000 In Interest Charges and Fees! is a great book about negotiating with credit card companies to reduce interest rates and eliminate fees. This advice can save you thousands of dollars, if you carry a credit card balance. The savings Bilker achieved were significant. In one phone call, Bilker got the bank to lower the interest rate from 13.72% to 8.75%, saving $4,320.00, based upon the existing credit card balance. I highly recommend Talk Your Way Out of Credit Card Debt to anyone who carries a balance on his or her credit cards or anyone who wants to gain skill in negotiating with a credit card bank to reduce interest rates or eliminate fees. Following Bilker's advice can save thousands of dollars in credit card interest and fees." "I don't know why a book like this has been written sooner. It contains so much common sense advice, I can't believe I didn't think of these things myself sooner. Thanks to Bilker's book I was able to take detailed notes, including names on promised rates for my IRA. When the promised rates didn't appear on my next statement, I was able to talk my way through many layers of resistance and finally get the original deal I was promised. I highly recommend this book to anyone with debt or who deals with any financial institutions for any reason." "This book is amazing. Reading it has opened our eyes to how much money we have been allowing to slip through our fingers unnecessarily. All my husband and I did before reading this book was complain about the outrageously high cost of borrowing money on credit cards. Since reading Bilker's detailed how-to-book, we have actually been able to call banks and save money. We couldn't be more grateful!" "I give this book my full recommendation! I've never seen a more detailed how-to book. If you have a credit card, you need this book! I think Scott outdid himself on this one. Almost everyone I know, and myself included, has been intimidated by credit card banks. To have an actual script to follow for all situations will be a godsend to a lot of people. Talk Your Way Out of Credit Card Debt is the one book that every credit card holder should have." "5 stars! Easy to understand, anyone can use it, very informative. I used Scott's advice in the book about calling the credit card companies and having the interest rate lowered on my credit card. I have learned what I need to say and how to negotiate. Whatever you need to know its in the book. Before I called I had a 14.99% for purchases and 19.99% for cash advances. After speaking to the representative for 7 minutes I had my rate drop to 12.99% for purchases and 14.99% for cash. Not only that but I have another card with them and the rate went from 19.99% for both to 15.99% for both. Not bad for 7 minutes. I wish everything was this easy. Total Save $1000.00!"